This upcycled denim jacket has been titled After The Glitter Fades because it was inspired by my favourite song by Stevie Nicks (the goddess of rock and roll!) of the same name. 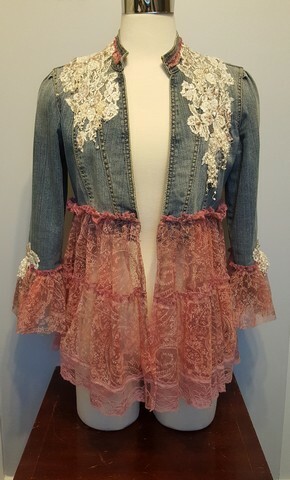 Sections of a tiered skirt, some tassel trim, pearls, crystals and tea dyed embellished lace appliques were blended with the denim jacket. 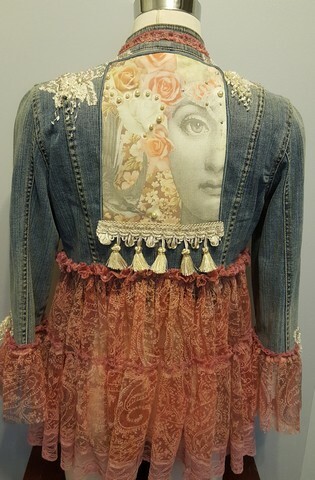 A Fornasetti inspired collage image has been placed on the back of the jacket to give a face to the lady in the song. My overall vision was to give the finished piece the feeling of a blending of various parts of the tattered remnants of the costuming and wardrobe of an aged, yet still elegant showgirl or film starlet of a bygone era. 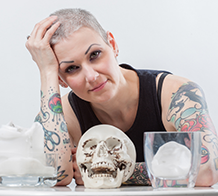 Imagine the stories she could share….